Bring your party from ordinary to extraordinary with a Combo! This bouncer rental provides over 400 sq. ft. of inflatable fun! It also features large netted vent windows to keep things cool, while allowing parents to keep a watchful eye on activities inside. There's an inflatable ramp at the entrance for safe entries and exits. 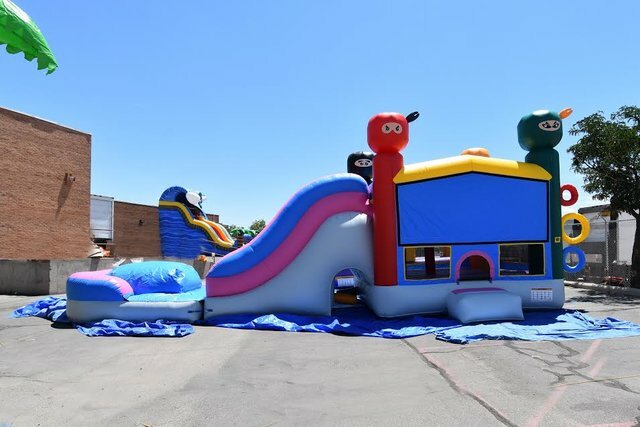 Go from jumping, to climbing, and finally zooming down the water slide all in one unit! Dimensions: 37ft wide x 19ft length x 17ft high. Requires flat surface for installation. Set up on anything but grass may incur extra fees. (ball not included) hoop, slide and jumping area let's your little girl be in charge.